The development of Sector39’s East African Permaculture work has been funded by Hub Cymru Africa as part of the Wales for Africa programme. This funding covered the period of April 1st 2017 to March 31st 2018. This has been invaluable support and for which Sector39 are extrememntly grateful. The following report covers this time period the outcomes from the funding support. Feed back and outcomes regarding the £10,000 of support given to Sector39 in March last year to be used between then and March 31st 2018. To use the course to develop strong networks in Uganda and across East Africa to reach both individuals and organisations that can help further these objectives. Disseminate information about this work in Wales and to raise awareness of Wales Africa links and support work. Present in local schools and community groups regarding this work and its wider potentials. Create opportunities for on going developmental training and work experience for African permaculture practitioners to develop and acquire teaching skills knowledge and experience. Participants of PDCUG17 course, holding up the targets of the Paris Climate Accord. We strongly believe permaculture is a powerful way to achieve the UN SDG’s and our collective climate responsibilities. The grant obtained from HCA has been utilised largely as planned and as outlined in our project bid so I don’t have any major changes to report. What I do want to report and forgive me for stepping outside the structure of the report form is that our feet have hardly touched the ground since began our project in May 2017. We have found East Africa to be very fertile ground for permaculture and have had a great deal of success in meeting these objectives. -I am currently in Uganda having just completed another successful round of training and realise I don’t have the final report form blank available so I am submitting this full report instead and will be posting this on the project website as well for reference. Sector39 have been teaching permaculture in the UK since 2005 and in 2014 we came out to Uganda with Dolen Ffermio (Wales/ Uganda farmer’s support charity, based in our community) on a study tour which prompted us to explore the possibilities for working in Uganda, teaching permaculture and building on the links we gained through our trip out with Dolen Ffermio. We did submit a bid in 2016 to HCA but were unsuccessful as we had not fully identified the beneficiaries and how we would measure the outcomes. 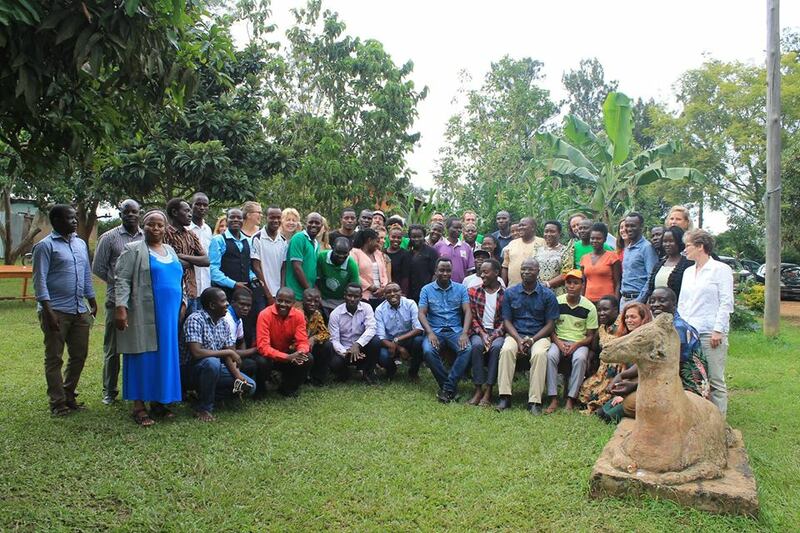 Instead of funding Sector39 took out a business development loan and proceeded to run our first full permaculture design certificate course (PDC) in Kamuli Uganda using connections we had made via both Dolen Ffermio and by using social media. This experience allowed us to write a fuller bid for 2017/ 18 which was successful and it is this I am reporting on now. 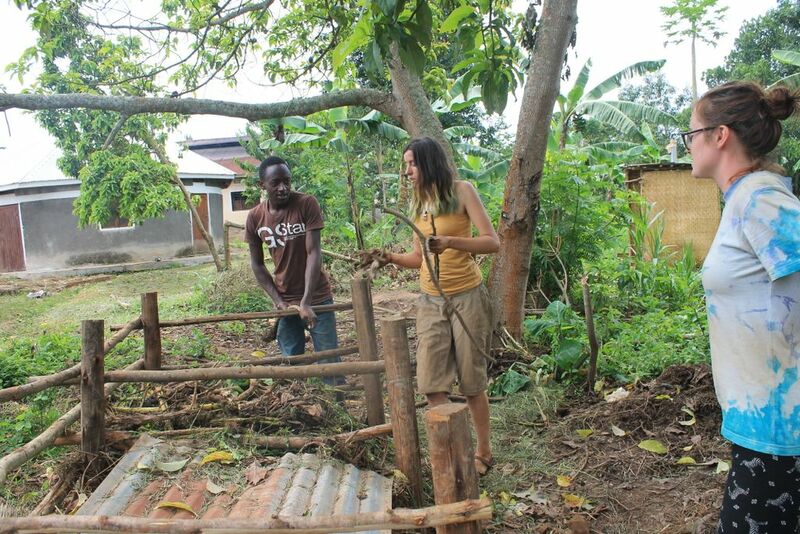 Full permaculture design certificate course in Kamuli Uganda. The May PDC reached 25 participants and Sector39 took out a team of 6 trainers from the UK as well as working with 2 Ugandans and 1 Kenyan we had met via the first course. This was the first big development for us, in that we connected with the Uganda permaculture networks and training organisations, dynamic and vibrant groups mainly populated by people much younger and less experienced than us but of course much netter connected to the grass roots of permaculture in East Africa. Several of the graduates from our first course were keen to return and to contribute to the teaching and running of the course as well as having met teachers and community leaders who were keen to introduce permaculture into their own schemes of work. So not did the numbers involved grow, we found ourselves reaching far beyond the networks we had originally worked with right into remote and much harder to reach groups. Training team from Wales of 6 people gained experience in teaching in this context and many insights and new connections were made. 25 Course participants completed the 14 day training, these drawn mainly from Uganda with 4 from Kenya. Our strategy was to recruit trainers, or people who were very active in their own communities. We wanted to identify participants who would in turn train others, start projects and demonstration plots and amplify the benefits gained from their training. We also understood that in this circumstance we needed to work with English speaking individuals with a degree of education behind them so they could benefit fully from the opportunity we were providing. The design to reach much harder to reach groups could be achieved indirectly through the work of the course graduates. Following on from PDCUG16 we retained those people who were most likely to develop as teachers and project initiators them selves. These included a Kenyan farmer and black smith, Paul Ogola who had since started his own demonstration plot in his home community and who returned with 3 individuals who had been inspired by his work and wanted to follow his example. A school teacher from Busoga High, Kamuli who wanted to initiated a student support project by developing growing and micro income initiatives within the school and who can connect us to regional educators. New contacts recruited via social media. Those who can be recruited and funded for course fees by other organisations with similar objectives. In process of developing and promoting the course S39 connected with like minded organisations who wanted to to access training for their stakeholders. These included Dolen Ffermio from Wales and Kumi Orphans project. Kriegskinder, from Germany supporting child soldiers and those training and supporting vulnerable people in conflict zones. The single most successful strategy to monitor outcomes from the PDC has again proved to be that of utilising social media and blogs to enable graduates to report on their subsequent work and to document their successes and challenges. This has also enable a cross fertilisation of experience between graduates from the course, using Facebook, WhatsApp and blogs mainly as communication tools. www.permaculturedesigncourse.co.uk using the hash tag #PDCUG17 and on Twitter with the same reference. PRI-UG network. S39 signed a partnership agreement with the Uganda permaculture network, which subsequently has linked us to PRI-Kenya and PRI-Zanzibar. Which has challenged us in turn to convene the first East African permaculture conference, which is planned to follow on from our May 2018 PDC. 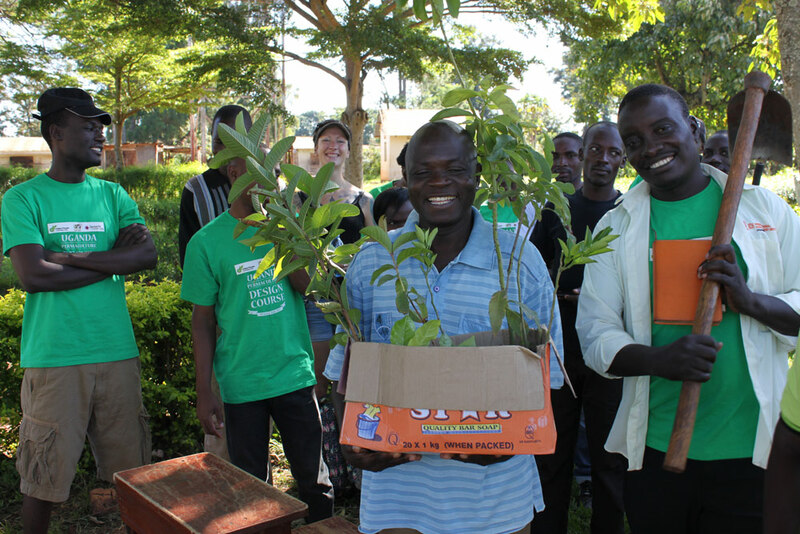 BEU Permaculture, Charles Mugarura has developed its focus on permaculture following on from the PDC and has been working with UG partners to link Sector39 to educators, politicians and grass roots activists. We were invited for a meeting on education and enterprise and development in Uganda with the OVP. Interesting the P.A. to Mr Mulla who was present at the meeting followed up the session by researching into permaculture which she followed by attending the 2018 PDC at Sabina school that we have just completed. The intention of the meeting was to seek support for permaculture at a political level and we have been offered support in any way needed as an outcome of the meeting. Permaculture Institute of Uganda, Bwama. 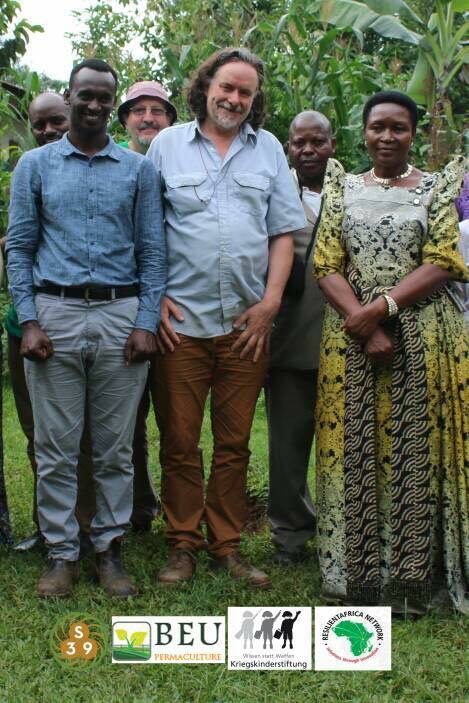 With Gerald Jagwe, course participant and key staff member at PRI-UG, we were invited to meet Mr Bakka on whose land is based the demonstration and research farm for the Permaculture Research Institute of Uganda. We had a site tour and discussed future collaboration. A Memorandum of Understanding was signed and we agreed to collaborate on future ventures. I have since been invited to act as a trustee for the organisation and we are still discussing this. Mr Jagwe is now working with Sector39 on our follow on project with the Norwegian Refugee Agency and he has proved to be an excellent contact. Mary is the patron of St Jude’s school Masaka as well as the minister for education for the region. S39 were invited to the school where we met the principle, staff and pupils before been given a full site tour. The purpose of this visit was to promote permaculture as a learning tool in schools and as a site management strategy to increase food yields and reduce waste at the school. We were invited to present at a regional head teachers conference the next day for 38 regional head teachers from both primary and secondary schools. I showed a full slide show for an hour followed by questions, the slides covered the PDC training in Kamuli and practical work we had done with Busoga High School where we had designed a planted an Agro-forestry/ food forest garden for the school. Following on from the head teachers conference we were invited by Charles Mugarura (BEU permaculture, Kampala) to visit the school/ orphanage where he had been a pupil and had grown up. Sabina had been founded as an orphanage and school as it was central the area with the highest HIV- Aids infection rate and consequently high orphan rate. 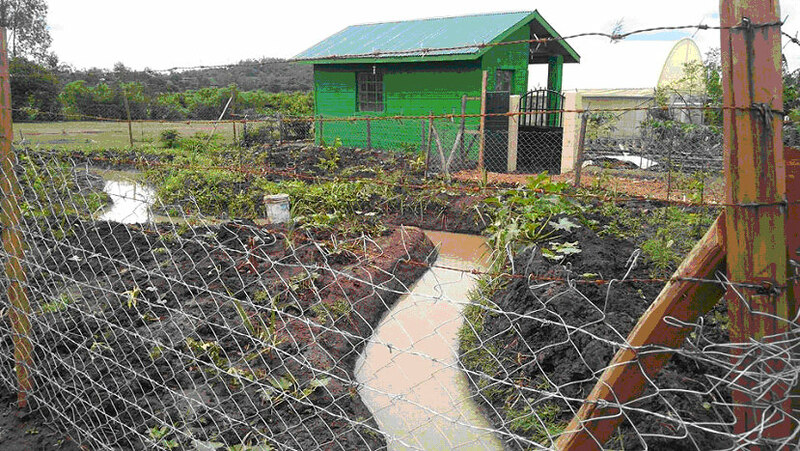 Links to the World bank had led to an international team coming to the school in 2008 where a permaculture course had been held and subsequent design being implemented. I met with Jude the head teacher and we discussed the possible placement of volunteers from Wales at the school, to help maintain and renovate some of the original design work and the possibility of their hosting a full PDC and conference there in 2018. 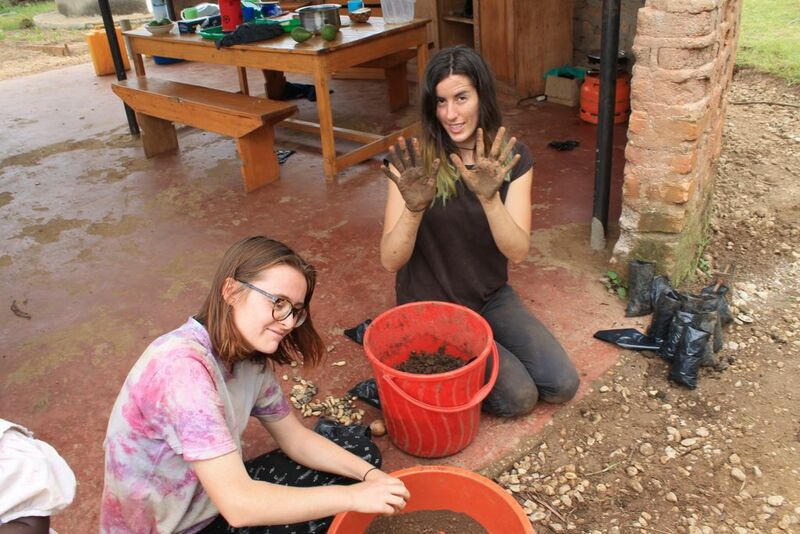 BEU permaculture agreed to sponsor and oversee three Ugandan placements at the school in a build up programme to the 2018 course and this would support the 2 volunteers from Wales who would join the team in late March. The flights and costs to bring the two volunteers out (Nina Duckers and Grace Maycock) were met from the HCA funds. I returned to Uganda in February, utilising funds from HCA to further these develops and firm up plans for the volunteer placements, the 2018 PDC and conference and to report to other contacts we had generated on the previous visit. Sector39 had been invited to present at Makarere University business school conference to around 150 students and future leaders in business. As 5th top business school in Africa this was n ideal opportunity to network and promote permaculture to future leaders. Steve Jones with some of the BEU team as well as some of the participants at Makarere Business School Feb 2018. A visit to Sabina School, (Ssanje, Kyotera district) confirmed the May PDC and set up the permaculture internships for Grace and Nina (both ex Llanfyllin High School pupils) and we developed a plan to establish permaculture gardens to demonstrate the key principles of organic cultivation. This is a very interesting an unanticipated development to come form this work. Happily in February whilst I was in Kampala the opportunity to meet with NRC came about. A co-incidence is that our new colleague Charles Mugarura attended a conference in Nairobi and was seated next to the head of the NRC and they chatted about permaculture. Sarah King from NRC commented she had done a full permaculture course in Wales back in 2006, with Sector39 so of course Charles mentioned my name as his permaculture tutor and mentor so the connection was made. The Ugandan head of NRC operations is also very interested in permaculture so a meeting was planned. Following on from several skype calls and a Kampala meeting I was invited to travel to Western Nile district to visit the South Sudanese Refugee settlements and to help write a proposal to bring permaculture into the refugee resilience programme as a tool for training and developing action plans. I spent three days in the settlements and then followed this with meetings in Kampala with various representatives of the organisation. In April I was invited to submit a bid for the work pan I had helped develop and Sector39’s bid was successful, beating a great many other applications (over 100 I was led to understand). This work commences in June this year and Sector39 have been able to recruit and train a team to lead on this work drawing directly on the contacts and training generated by the HCA funded work. As placements in Sabina school in advance of the 2018 PDC Nina and Grace travelled to Uganda on 27th March 2018 using the last of the HCA funds to establish them selves at the School. We have planned and hope that this opportunity can be extended to future participants as well, now that the precedent has been established. This is a training centre created directly as a result of the training delivered by S39 in Uganda. It is in Homa Bay Kenya and was directly inspired by the PDC training. The class room pictured was crowdfunded, using skills learned on the course. They are already running regular courses and Paul Ogola the project initiator has already become an adept permaculture teacher. Students from the course set up this Facebook page to record their subsequent work, it stands as a great testament to the training and the outomces are out going. Permaculture East Africa Stuents Union Facebook has proved a successful way to keep track of some of the outcomes following on from the course. 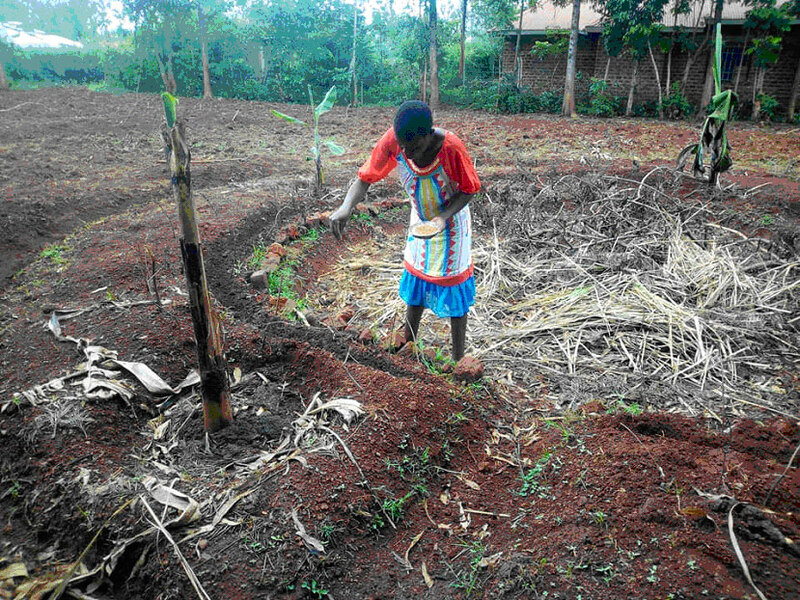 One technique for integrated farming demonstrated and taught on PDCUG17 was that of the banana circle. Using a mixture of ground profiling to catch rainwater, a mulch pit to promote water retention, composting and nutrient availability this mix of perennial and annual plants creates a more stable plant guild that can be both highly productive and restorative to degraded soils. 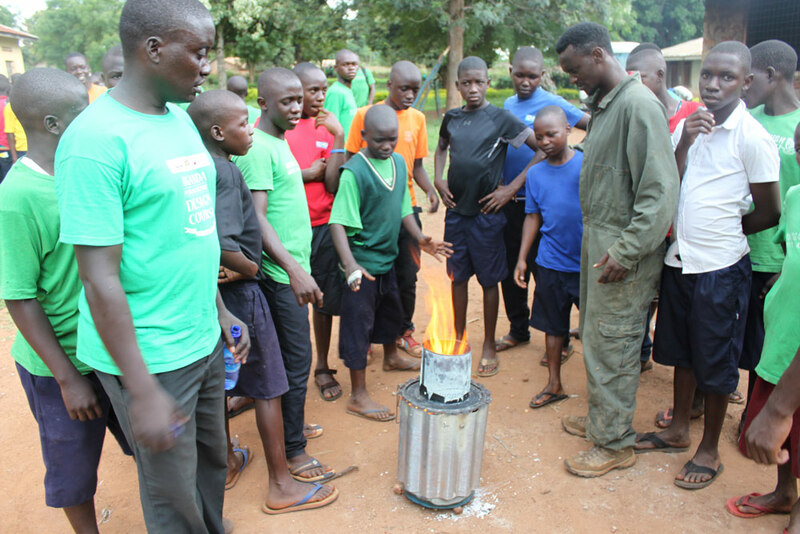 A second technique demonstrated on the course was that of making and using biochar as a soil additive. Creating high quality charcoal with all the volatile oils driven off by heat enables a pure carbon soil additive to be used that both increases water infiltration into soils, boosts habitat for soil microbes and remains stable in the soil for log periods of time. You can see it being added here in the image above. What has been noteworthy is that course graduates, esp Prince Sebe Maloba, Pual Ogola, Godfrey Opolot and others have taken these ideas and made them their own. They have experimented with different biochar making retort kilns, different inoculants to boosts fertility in the biochar, different planting combinations in the tree guilds as well as different shapes and sizes of the circles themselves. Permaculture encourages the adaptation of ideas and techniques to suit local conditions, materials availability and cultural preference. Literally a hundred or more of these have been planted since the training in May 2017 and we have received numerous photos and reports back on the progress of the idea as it continues to morph and evolve. The final tranch of the HCA funds, as mentioned before were utilised in Feb in a follow up visit to Uganda by project leader Steven Jones who lectured at Makarere business school on this and other work, visited the vice President’s office to report on potential s for permaculture in schools and education and to set up the net, bigger and more ambitions PDCUG18 and conference. We now have a network of Uganda and Kenyan partners and trainees we can draw from for further project work and in turn these has broadened again to include Tanzania, Rwanda, Congo, Zanzibar, Zambia and Zimbabwe. All of this experience has led to S39 winning a highly competitive bid to take Permaculture education to the Western Nile region to work with South Sudanese refugees. S39 will be working with another welsh partner Jack Hunter PhD in Llanrhaeadr Ym Mochant to share this experience with schools in the area, namely Llanfyllin High School and also to develop teaching resources in Welsh, English and Arabic to share the experience and insight of permaculture in both locations. We helped develop this website and host it on our own server. BEU is a training and enabling enterprise in Kampala who are supporting our longer term objectives for permaculture education in East Africa. The May 2018 PDC has now been completed, with 42 participants and 18 staff and trainee teachers. This was followed by a 2 day permaculture conference, which drew participants from 12 countries and was the first East Africa permaculture ‘Convergence’. This event was funded by selling places on the PDC’s donations from supporters in the UK, US and elsewhere and was made possible by the groundwork in the preceeding 12 months which was supported by the Welsh Government. A final outcome was a visit from the Honourable Rosemay Sininde and Minister for Primary education Matthias Kasamba, East Africa legislature representite who closed the PDC and expressed great enthusiasm for the achievements of this work. We are excited for what may happen next. Sector39 and partners would like to thank Hub Cymru Africa and the Wales for Africa network for their support, without which we would have not been able set this work and its many outcomes in motion.